Plantar fasciitis is a painful condition that may limit your ability to walk and run. It occurs when the plantar fascia, the tough tissue on the bottom of your foot, becomes inflamed or irritated. This may occur if you have high arches, fallen arches, tightness in the muscles around your foot, or if the bottom of your foot experiences overuse and repetitive strain. Management of plantar fasciitis involves a thorough assessment from your doctor or physical therapist to determine the cause of your foot pain. If you have pain on the bottom of your foot, you should see your doctor or physical therapist before starting any treatment for your condition. Initial management of plantar fasciitis involves controlling the inflammatory process in your foot. This usually involves using ice to decrease the pain and inflammation in the plantar fascia. Ice packs can be applied to the bottom of your foot for 10-15 minutes, several times a day, to control the inflammation. Another way to apply ice to your plantar fascia is with the ice bottle massage. This application technique has the added benefit of gently massaging the tissue on the bottom of your foot while icing it. The ice-bottle massage can provide a gentle stretch to your plantar fascia, which may help to improve overall mobility in your arch and foot. Obtain a plastic water bottle. If you've purchased bottled water, you may wish to actually drink it first, since you already paid a premium price for filtered or spring water. Fill your water bottle about three quarters full (make sure it's not filled to the top). Put the bottle in your freezer, and leave room for the water to expand as it freezes. Keep the cap off the bottle as the water freezes, but save the cap. Be sure that the bottle does not tip over in your freezer. Wait a few hours for the water to freeze, and then remove the bottle and put the cap on it. Sit in a chair and lay the ice bottle on the floor on its side. Slowly roll your painful foot over the water bottle, then press gently into the bottle to massage your painful plantar fascia. You can perform the ice bottle massage for 10-15 minutes several times a day—just be sure to store the water bottle in your freezer after each use. Once the inflammation in your foot is under control, you may need to improve the flexibility of your calf and plantar fascia to further manage your condition. The plantar fascia stretch and the towel calf stretch are two simple and effective ways to improve the flexibility around your ankle and plantar fascia. After performing exercises for your feet, you may wish to continue the ice bottle massage for your plantar fascia to keep pain and inflammation to a minimum. Many times, poor foot position may cause plantar fasciitis, so be sure your PT checks to see if you require show orthotics to keep your foot in the best position possible while walking or running. Kinesiology tape is sometimes used to help support your foot and treat plantar fasciitis. Exercises for your entire leg may be beneficial if you have plantar fasciitis. Hip strengthening exercises and balance and proprioception exercises may be required to fully treat your condition. 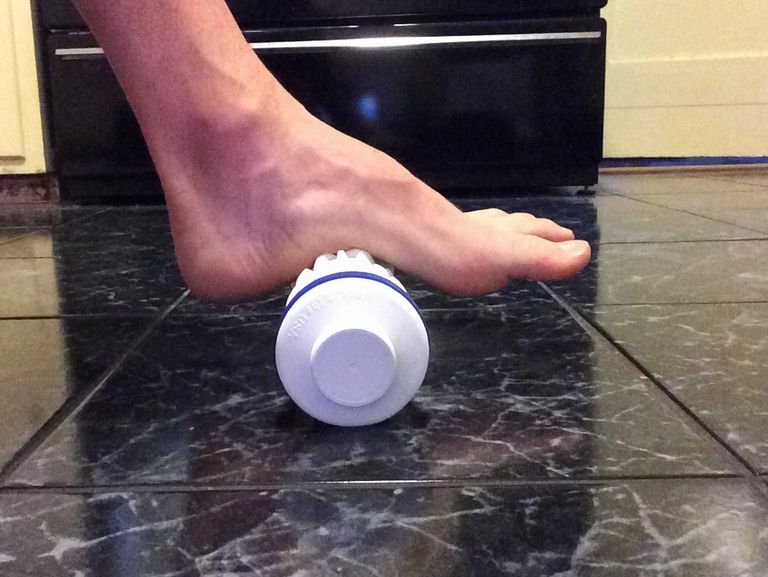 Bottom line: engaging in an active exercise program may be necessary to fully treat your plantar fasciitis. By keeping your entire lower extremity strong and flexible, you can properly treat your plantar fasciitis and prevent future episodes of it from occurring. With regular stretching, strengthening, and icing, you can expect your symptoms to slowly dissipate over about six to eight weeks. Some severe cases of plantar fasciitis take longer, and often symptoms go away after only a few weeks. Be diligent with your exercises and the ice bottle massage; this can make a difference in your condition. Plantar fasciitis can be a cause of foot pain and may limit your ability to perform normal everyday tasks. The ice bottle massage technique may help you control the inflammation in your foot to help you return to normal activity quickly. Lim AT, How CH, Tan B. Management of plantar fasciitis in the outpatient setting. Singapore Med J. 2016;57(4):168-70. Can an Operation Fix Arch Pain? What Is Plantar Fasciitis and What Can I Do About It? Can Shock Waves Be an Effective Treatment for Pain? Heel Spurs and Plantar Fasciitis: What's The Difference? What Is Instrument Assisted Soft Tissue Mobilization (IASTM)?